Lenovo is entering MacBook Pro Retina territory with its new Y50 and Y40, a disk drive-less additions set of notebooks featuring Ultra HD 4K displays. Featuring an optional Ultra HD 3840 x 2160 screen, the 15.6-inch Lenovo Y50 is pegged as a lightweight Ultra HD 4K gaming laptop. The Y50 can be optioned up to a 4th generation "Haswell" Intel Core i7-4702HQ processor as well as one of the latest Nvidia GeForce GTX graphics card. Of course the biggest change from Lenovo Y500 - other than that one less zero - is Lenovo scrapping the disk drive to make the new laptop just 23.9mm (0.94in) thin. The Y50 also comes with 16GB of DDR3L memory stock. Customers will have options to swap out the 1TB HDD for an 1TB hybrid drive with 8GB of SSD cache or a 512GB SSD with Windows 8.1 preloaded. The Y50's 14-inch little brother, the Lenovo Y40, is similarly spec'd though it comes with a 4GB AMD Radeon R9 M270 dedicated graphics card. Both the notebooks also have a 720p HD webcam, USB 2.0 and USB 3.0 ports, HDMI-out, and a 2-in-1 card reader. Lenovo stated the new ultra-portables will enter the market beginning in May starting at $999 (about £608/AU$1,115). 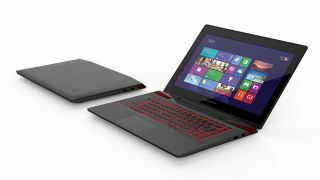 Keeping in line with maintaining portability, Lenovo also introduced two other lightweight notebooks, the Z40 and Z50. The 15.6-inch Lenovo Z50 features a 16:9 inch widescreen with an optional maximum resolution of 1920 x 1080. Underneath, the processor can be bumped up to a Haswell Intel Core i7-4500U processor, a 4GB Nvidia GeForce 840M for graphics, and 16GB DDR3L memory. The Lenovo Z40, the Z50's littler 14-inch brother, comes outfitted with the same hardware. The smaller Z40 road-warrior also weighs a bit less at four pounds (2.1kg), where as the Z50 is a five pounder (2.5kg). Windows 8.1 comes preloaded on the Z50 and Z40's 1TB HDD or 1TB Hybrid Drive with 8GB of SSD cache. Lenovo promises its Z-line of notebooks will have a battery life of five hours when they land later this March for $599 (about £365/AU$668). In the last line of lightweight designs, Lenovo also brought out the C560, an All-in-One desktop bringing 23-inch touchscreen interactivity to the family. With a 1920 x 1080 multitouch display, the C560 will swipe quickly through animations as it comes powered with an Intel Core i3-4130T processor and 1GB Nvidia 705A graphics card. On board, there's also 8GB of RAM and a 2TB 7200rpm HDD with Windows 8.1 preloaded. Another ringer in the AiO line up, Lenovo also added the A740. The biggest thing about the A740 is its honking 27-inch, WQHD 2560 x 1440 desktop screen. There's also more than a handful of internals to gawk at, including the Haswell Intel Core i7-4558U processor, Nvidia GeForce GTX graphics card, and 8GB of RAM. Moving Android to the big screen, the Lenovo N308 is perhaps the first time we've seen Jelly Bean blown up on a 19.5-inch touchscreen. Like a beefed up tablet, it's powered by the Nvidia Tegra quad-core processor and an integrated 72-core GPU, as well as 2GB DDR3 memory. We doubt it's for ideal carrying around at 4.6 pounds and a battery life of 3 hours, but at least it comes with a 320GB of base storage. Lenovo has priced and scheduled the C560 to arrive in February for $659 (about £401/AU$735), A740 AiO this June for $1,499 (about £913/AU$1673), and the $450 (about £274/AU$502) Lenovo N308 in February. It's a lot of AiOs and laptops to take in, but soon we'll get our hands on them and suss out the keepers in Lenovo's lineup here at CES 2014.